After scouting an area for a couple weeks I set up along a field edge by a natural funnel area where I had spotted several bucks. I had an eight point on my trail camera which was no monster but seemed to be a average buck. After a couple days of hunting and several small bucks I checked my pics again and there he was, Standing proud and sporting a beautiful rack. I spent the next few days in my ground blind. Again I had seven different smaller bucks come through and enjoyed watching them waiting patiently knowing there was a trophy in the area. On the third day a storm started to roll in about 45 minutes before dark and it was beginning to rain. I looked out to the west and saw a flash of lightning in the distance so I decided I should get going when a deer showed up in front of me. I didn't want to spook it or give up my location so I decided to wait a little bit. A few seconds later he picked up his head and there he was, the buck of a lifetime. After picking my jaw off the ground and getting myself settled down, I waited for the opportunity to get a shot. After what seemed like forever ( probably only 15 minutes) he turned broadside and gave me the shot. I put the 20 yard pin on him and released the arrow. The shot looked good but I was so excited I wasn't sure. It started raining harder now, so I decided to check for blood and found the arrow right away and it was full of blood confirming a good shot. I started looking for a blood trail right away hoping the rain wouldn't wash it away. After searching for several minutes I decided to start making phone calls. The rain started getting heavier and the forecast was for a lot of heavy rain for the next 3 days and I was worried that if I didn't find him that night I might not. So I called my wife Laurie and let her know I hit the monster and needed a light for all I was carrying was a pen light I used to get in and out of the woods. She called my son Eric and I called my daughter Michelle and her husband Jesse to come as soon as possible and soon after we found the buck. With Gods blessing he only went about 30 yards and I was ecstatic with the sight of this awesome trophy. We stood there in awe for a little bit and decided we were wet enough and headed back home where Michelle and my granddaughter Kylie were waiting anxiously for their first viewing. 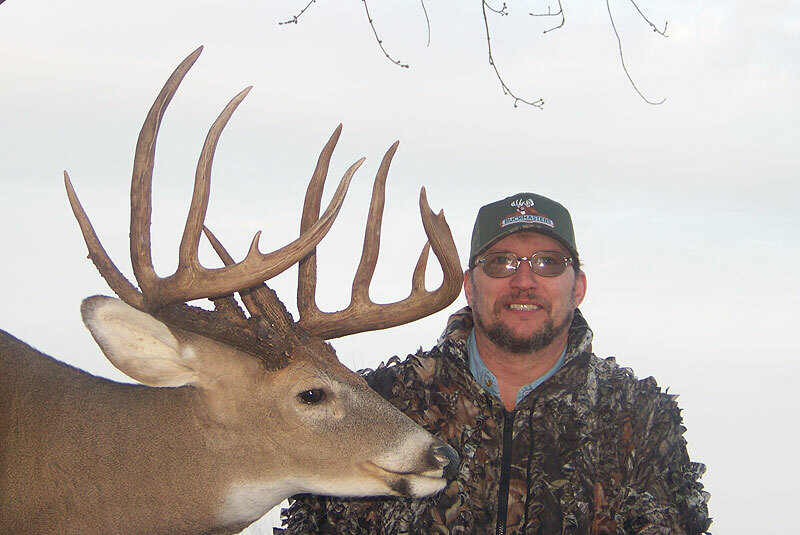 He sported a 12 pt rack with 20 1/2-inch spread and officially scored 182 6/8 net B & C and P & Y which is a new Marathon county WI typical record. Bear strike-bow with a Rip-cord drop away rest, TruGlo sight, TruFire release, Easton N-fused carbon arrows with Rage 3 broadheads, Voo-doo ground blind, Gillie suit, c-mere deer cover scent.